San Francisco Bay Area commercial building owners can avoid the expense and time needed to replace their flat roofs. By ensuring that some simple measures are followed, you could easily prolong the lifespan of your flat roof. Ideally, nowadays, all flat roof buildings should have sustainable roofing systems which only require periodic maintenance. At Armstrong, for over 30 years, we have been installing Spray Polyurethane Foam (SPF) roofing systems which provide unsurpassed protection against the elements, excellent energy efficiency, low maintenance and start to pay for themselves the moment they are installed. Our flat roof specialists will make sure your SPF roofing system will last a lifetime with minimal maintenance. No matter what type of roofing system you have installed on your flat roof building, it is always prudent to have a proactive approach to its maintenance. It could mean the difference between replacing your roofing system in 25-30 years (in the case of SPF roofing, you may never have to replace it) as opposed to a neglected roof which could need replacing within a decade after it has been installed. All roofing experts agree that the most important measure you could take in protecting and extending the life of your flat commercial roof is to keep track of its current condition. You need to have your roof inspected systematically, along with the interior, including any adjacent walls and ceilings. By conducting regular inspections, you can identify any possible issues at an early stage when they can be easily dealt with. As we have mentioned in a previous article, inspections should be conducted at least twice a year, in the fall, after exposure to the high temperatures of summer, and in the spring to look for damage caused by winter weather phenomena. Apart from inspecting your flat commercial roof bi-annually, if it is not very difficult to access your roof, checking it and cleaning any debris once a month may save you from future problems. In addition, if you have contractors conduct any type of work on your roof, the surface should be inspected for any accidental damages caused by heavy foot traffic or due to the penetration of the roof surface. A comprehensive roof inspection should examine roofing membranes, drainage systems and flashed areas such as penetrations and edges. The majority of leaks begin forming at these roof intersections. If the leaks are not identified during an inspection, they can easily increase in severity. Locating the source of an issue at an early stage will help you avoid expensive repairs in the future. If any issue, serious or minor, is identified, you should have it repaired as soon as possible. Ignoring minor issues can result in having to deal with costly issues later on. Normal wear and tear should be repaired on a regular basis by establishing a roof maintenance plan. This plan should provide clear guidelines regarding maintenance and repair procedures, ensuring that repairs are conducted timely and professionally. By doing so, you will protect your commercial property and avoid unnecessary expensive repairs in the future. It’s much cheaper and easier to fix a minor issue rather than repairing a leaking or damaged roof. 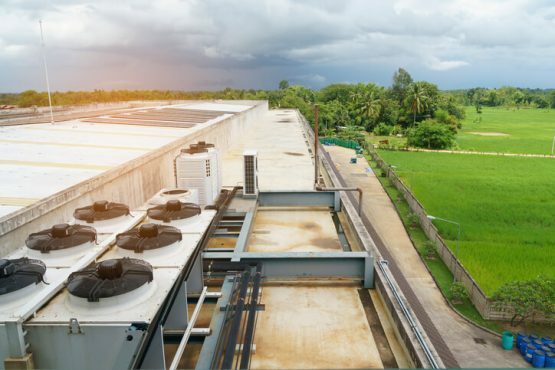 As part of your flat commercial roof maintenance, you should ensure that any accumulated debris is cleared away and rainwater is able to flow through drains and downspouts. What’s more, you need to address potential problems that can result from nearby trees. Any overhanging tree branches should be pruned to avoid damage to your roof and, generally, your building. In order to conduct proper inspections, maintenance, repairs, and installations, you should contact a reliable and trusted local roofing company with years of experience. Armstrong Roofing has been proudly serving San Francisco and the Bay Area since 1966 by providing the best roofing solutions to local companies and residents. Our roofing crews are experienced and highly-trained professionals who always provide you with a new well-installed and trouble-free SPF roofing system. That is why Armstrong roofing offers its customers the best and longest-lasting warranties available for their new SPF roofing systems. (Please note, that Armstrong does not conduct roofing inspections, however, we will be glad to provide you with a free estimate for a new SPF roofing system). Contact Armstrong Roofing today to book your Free Estimate for a new SPF roofing system for your flat commercial roof.